UnitedHealth Group continues to post hundreds of work from home jobs – some 100% telecommuting, others partial telecommutes with some days in the office. Today, there are 359 positions listed as “Telecommuter” jobs. The types of jobs we frequently see posted among their work from home opportunities include, event specialists, sales reps, nurses, research scientists, consultants, managers, claims adjusters, analysts, executives, IT, pharmacy, case managers, doctors, and more. 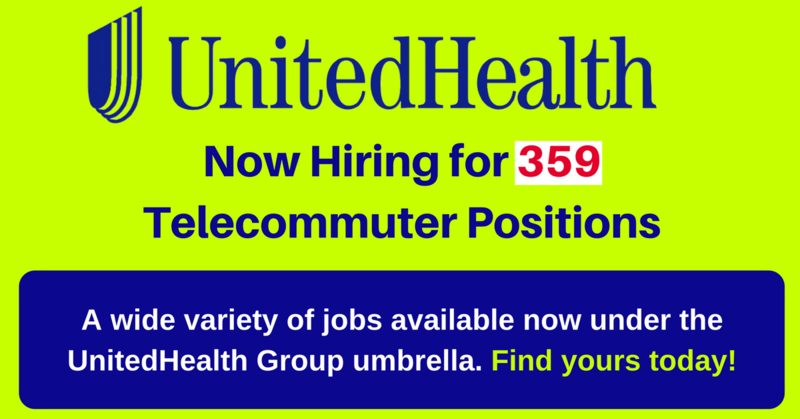 To see the telecommuting positions OPEN NOW with UnitedHealth Group, click here. For more job options, see our Daily Jobs & Gigs page. To be the first to hear about jobs like these, like our Facebook page. Good luck in your work from home goals! This entry was posted in Administrative & Clerical Jobs, Hiring Companies, Jobs with Benefits, Nurses, Tech Support, Work at Home Jobs and tagged UnitedHealth Group. Bookmark the permalink.